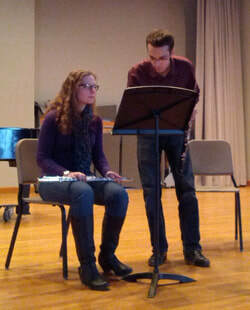 Coaching woodwinds at Kenyon College, Ohio. I consider teaching to be a vital part of any musicians' career, as we pass down this incredible tradition to the next generation. I teach at Wilfrid Laurier University, as well as privately in London, Ontario. I am on faculty as an oboe instructor at Wilfrid Laurier University (WLU). If you are hoping to continue your oboe studies at university, WLU is an excellent choice. The oboe studio has a long history of producing high-level players who perform and teach professionally as their livelihood, which is the result of a studio culture of supportive competition. Between Richard Dorsey (former principal oboist of the Toronto Symphony) and myself, we have years of playing and teaching experience to help you become the best oboist and musician you can be! For more information about the WLU faculty of music, please click here. Welcome! I look forward to helping you or your child reach your musical and oboe-related goals. I am an experienced, enthusiastic teacher, and I enjoy teaching students of all ages and levels of ability. My only criteria for acceptance is that you have a positive attitude, an open mind, and a willingness to learn. I am determined to make lessons engaging, inspiring, and fun! The oboe has a reputation for being one of the most frustrating instruments to learn, but I know from experience that it does not have to be that way with the proper guidance and equipment. Lessons can take place at my house in London, Ontario (on Walnut Street, just west of Wharncliffe and Riverside) or at yours. My rate is $50/hour (or $30/half hour) for lessons at my house, and will be slightly higher if elsewhere, depending on the distance. If you are interested in signing up, please send me a message using the contact form. If you are interested in pursuing other avenues of musical study (piano, theory, harmony, or recorder, among others), please visit Tumble Reeds Music, the teaching studio my wife and I run out of our house. I look forward to helping you or your child discover what an incredible and rewarding experience the study of music can be! "I am an adult learner, and have playing the oboe for about four years. Graham Mackenzie has been my oboe teacher for only four months, but in that time, I have learned important things to improve my oboe performance. This has been exciting as some points were so easy to learn with him yet missed previously! I appreciate his earnestness, patience, thoughtfulness and professional approach. Even though he is a seasoned professional who is stunning just to listen to, he seems to remember what it was like to be a student, analyzes my playing, and targets what I need to understand to move forward. I now feel supported and on a learning journey in which I am confident I can be successful in, thanks to Graham. His insights and help have also significantly improved my reed making. I am looking forward to continuing my studies with him."